I can always go for a good curry dish, but ordering take-out can be so calorific when it comes to thai or indian curries. So when I came across this lower cal version that sounded quite interesting I knew I had to try it. 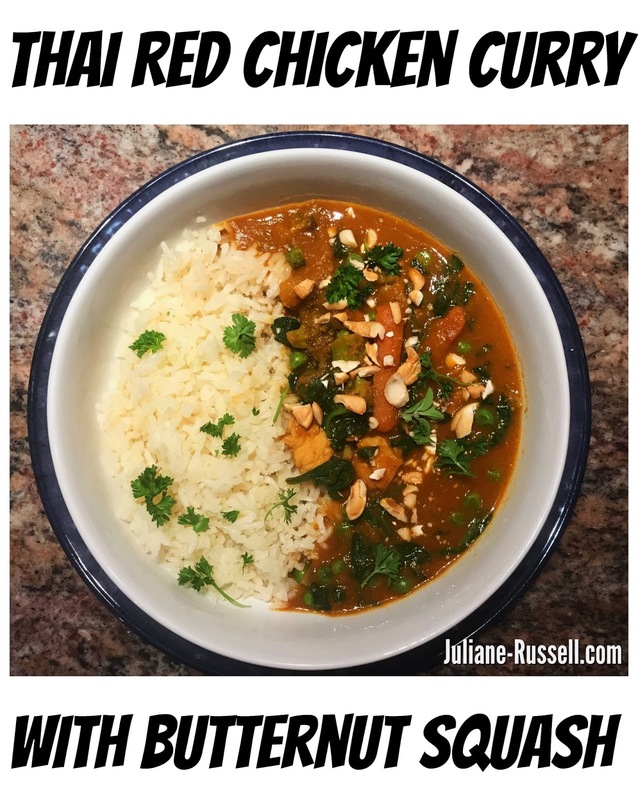 The original recipe did not call for chicken, and I bulked this one up with extra veggies, but it turned out amazing and I couldn't wait to share. For a low cal option serve with cauliflower rice, or you could do a combination of cauliflower rice and jasmine or basmati rice like I did. Naan bread would also go amazing with this. Heat the oil in a large, deep skillet over medium high heat. Add the chicken and cook through. Remove from pan and set aside. Adding remaining tbsp of oil. Add the shallots and saute them for 5-6 minutes or until they just begin to get golden. Add the butternut squash, broccoli, carrots and grated ginger, stir to coat with the oil. Add the red curry paste, yellow curry powder and stir until all the butternut squash is nicely coated. Continue to cook the curry paste for 2-3 minutes or until it’s fragrant. Add the broth, coconut milk, fish sauce, and sugar. Add chicken back in. Let the sauce come to a simmer before covering. Lower the heat and allow the squash to cook all the way through, about 12-18 minutes. You’ll know it’s done when you can easily pierce the butternut squash with the tip of a knife. Stir in the baby spinach and peas and allow spinach to wilt and peas to cook through. Serve with basmati rice, jasmine rice or cauliflower rice topped with crushed cashews and parsley.